MANILA—Cignal-Ateneo survived Family Mart-Enderun's assault and took the 82-68 win Monday in the 2019 PBA D-League at Paco Arena in Manila. 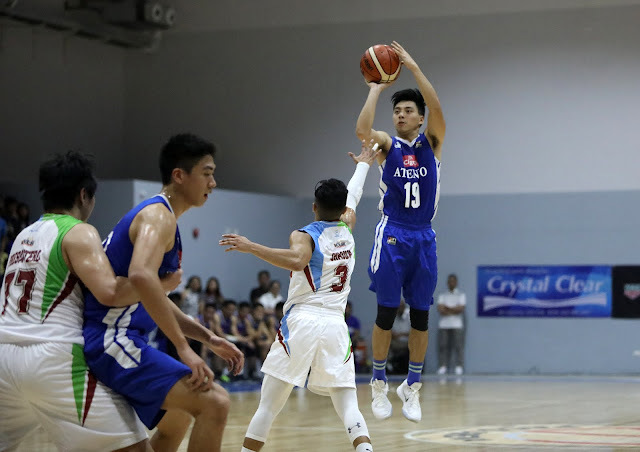 Tyler Tio was instrumental in helping the Blue Eagles break off from the Titans, pouring 20 points, 14 coming in the payoff period, as he went 6-of-9 from beyond the arc, as well as nabbing five assists and grabbed two rebounds. Ivorian center Ange Kouame was a force to be reckoned with down low as he got 20 points, eight rebounds, five blocks, and two assists, while William Navarro chimed in nine points, 15 boards, and three assists, on top of a steal and a block in the victory. "It's a tough game, good game," remarked coach Tab Baldwin. "Enderun got the jump in the beginning. But our defense kicked in after first quarter. Offensively, we don't ask a lot right now, but Tyler did a good job, Ange pulled some boards, and Will Navarro did a good job for our guys. I'm happy that we got the win." Tio's sudden explosion in the fourth quarter broke the game wide open as Cignal-Ateneo wiggled out of Family Mart-Enderun's reach as the UAAP champions took a 19-point lead, 79-60. Valandre Chauca paced the Titans with 27 points as he shot 5-of-11 shooting from threes, to go with five rebounds and three assists. Marvin Hayes added 12 points and eight rebounds in the defeat. CIGNAL-ATENEO 82 -- Tio 20, Kouame 20, Navarro 9, Andrade 8, Go 7, Ma. Nieto 6, Mi. Nieto 4, Daves 4, Mamuyac 2, Credo 2, Berjay 0. FAMILY MART-ENDERUN 68 -- Chauca 27, Hayes 12, Nunez 9, Sacundo 6, Vidal 4, Presbitero 3, Mariano 3, Gotladera 2, Gatdula 2, Dela Cruz 0, Dungan 0, Oebanda 0. Quarters: 18-20, 39-33, 57-50, 82-68.